Today's Interview is with Serafima Bogomolova - the Author of the Psychological Thriller My Trickster - released in 2012 - The book received so far great reviews. Even though I appreciate stories and books written by authors coming from different backgrounds I was greatly inspired and influenced by Russian and English classics. My favorite Russian author is Anton Chekhov, one of the greatest writers of short stories in history. He used to say: 'Brevity is the sister of talent.' And my favorite English author is John Fowles, a master of mystification in modern literature. I don't really have writing influences. I believe I have my own distinct writing style, and I do not compare myself with anyone. However, very often I get inspired by work of talented writers. "I write when I feel like and have something to say." I do not have a writing routine. I write when I feel like and have something to say. When I write I use my writing 'clairvoyance', in other words my creative intuition. I feel my way through a story, moving forward one step at a time. I try to be as careful and gentle with my creations as I can. Sometimes, pushing too much can destroy the magic of creative process. Some days, I don't feel like writing at all, and I do not attempt to. When I was writing My Trickster, I felt as if I was guided through the story: it was literally unfolding right before my eyes. I 'watched' my book as if it was a movie! For me, writing is easy. What I find challenging, however, is choosing right words to relay on paper what I see as images in my mind's eye. I paint stories using words. Words for me are like colors on a color palette. Each word has its own significance and place in my 'paintings'. My goal is to have my finished work 'talk' to my readers, evoking their emotions and creating an intimate bond with them. Serafima, please tell us a little about your debut novel 'My Trickster'. I started My Trickster in January 2011 and finished it beginning of December 2011. The book is partly based on true events, and all of the characters are based on real people whom I have met and dealt with in my life. The story line was developing as I wrote, I never planned anything in advance, I even did not know what the end would be until one day I saw it in my mind's eye. The title for the book came to me when I was half way through the story. But one thing for sure, I knew from the very beginning that it is going to be a thriller, a fast paced one, with many twists. Whom do you see as your target audience and where can we buy the book? My book will strongly appeal to women. This is not because its main heroine is a woman, but because I feel it will be hard for most men to accept certain angles of this book, especially coming from a female writer. Women, especially the ones, who are in need of building confidence in dealings with men, and the ones, who wish to be more daring in life, will love this book. Its main heroine, Angela Moreaux, is a universal role model of an extraordinary woman, enigmatic, magically feminine, intelligent, and strong. The type of heroine that is a rarity in modern literature, and because of this is even more attractive and fascinating. As one of the male readers said: Angela is two women in one, and is all women at the same time. My Trickster will also appeal to men, the ones who are fascinated with the subject of enigmatic femme fatales. I'd say this: the mere fact that I wrote my first book is already a huge success on its own. Now I am in the process of making it a financial success. So far, what has been achieved is this: I started from promoting my book among my friends first, some of them bought it and some received it for free, then I moved on to my acquaintances and friends of friends, and now I am working on promotions to a wider audience, and there are already some people outside of my network that have bought my book. I would like to expand on this circle of readers/buyers, but I am also very well aware that it takes time for the book to be noticed by a wider audience. I do believe in word of mouth promotion, and I am glad to say that the word is being spread, slowly but surely. 11 months: Jan 2011-end of November 2011. I have published the book as a hard copy with Lightning Source (a professional company working with small and big publishers), and published a digital copy with amazon.com, Smashwords, and Lulu. The self-publishing process went quite smoothly. This is partly because I have a media publishing background and I used to have my own digital magazine. I think that the challenge is not in how to publish your book, the challenge lies in finding the right promotional channels to get to your audience and to make the book stand out and be purchased. Yes, I hired an editor and a professional designer to design the cover. "[...] writing is an art, not a 'craft'." I feel that many people write nowadays because it is a sort of escapism from their daily routines and 'grim' realities, and also a way of channeling their fantasies and longings that otherwise would stay suppressed and unexpressed. It is fantastic that modern technology offers means of sharing these expressions with others and even involving them into a conversation on international level. However, personally, I think that writing is an art, not a 'craft'. One of the tips can be: write to express yourself, but publish only if you feel you have something to contribute to the world. And, if you do, approach the process seriously and do it well. It is not the expressionism we are short of it; it is the professionalism that is in demand. I have ideas for two more books. However, I have not yet started working on them. I would like to sort out the promotion and marketing for my 'début' book first. "I enjoy freedom of self-publishing [...]"
I enjoy freedom of self-publishing and love being in full control of the process from writing, to editing, to publishing and marketing. However, if a traditional publisher approaches me and offers to purchase rights to publish my books I would not say no. Where do you see the book market in 5 or 10 years? Will there be only eBooks and will bookstores disappear like record stores disappeared? I think that there will be space for both e-books and print ones. E-books are convenient and print books are tangible and because of this are more special. I think there will be fewer of traditional bookshops, but more of concept bookstores, which will combine coffee shops, books, gifts, and Wi-Fi areas etc. I believe that books will be purchased mostly online with concept bookstores being more of a place to hang out, meet friends, and network. Right now, I am at this stage of my life that I can afford to be a full-time writer. I am thankful and grateful to my wonderful husband who supports me financially and morally, which allows me to focus on developing my writing career. Thank you so much for the Interview, Serafima. When enigmatic Angela Moreaux, a woman he thought he had exorcised from his brain, calls and asks for his help, reluctant, but unable to resist, Juan MacBride, a hedge fund owner and an expert in stock market manipulation, flies out to Moscow. 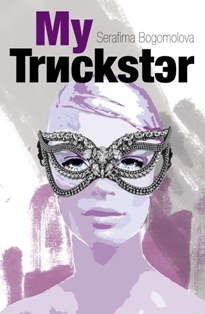 Witty, intense, seductive, full of unexpected twists and mind-twisting turns, My Trickster is a psychological thriller that invites you to plunge into an exhilarating read comparable only to a Ferrari ride with a stunning woman in the driver's seat! The book's artful plot and unforgettable characters provide a perfect back-drop for the following of gripping adventures of its main heroine, Angela Moreaux (La). Written in simple but captivating and alluring style - My Trickster has a very distinct cinematographic feel to it. This Book is like magic liquor. Once you had a taste of it, you would crave for more!